Strong growth in MCUs for IoT applications and suppliers jockeying for marketshare in this IC segment have resulted in several major acquisitions that changed the pecking order of MCU leaders in 2016, according to data released in IC Insights’ April Update to The McClean Report, which was released earlier this month. 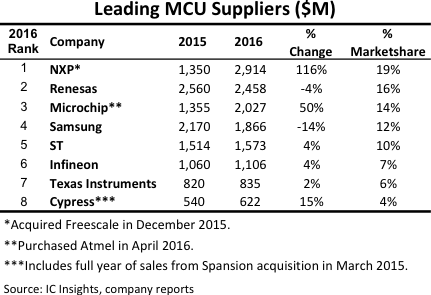 Figure 1 ranks the largest MCU suppliers in 2016 by dollar-sales volume. Among the top MCU suppliers shown, NXP, Microchip, and Cypress Semiconductor moved up in the sales ranking during 2016 with strong increases in revenues, which were driven by acquisitions of IC companies that sold microcontrollers. Meanwhile, those suppliers not making significant acquisitions in microcontrollers posted low-single digit percentage increases or declines in MCU sales in 2016. Although overall growth in microcontrollers has wobbled and stalled in the past couple years, MCUs remain at the epicenter of tremendous growth in the Internet of Things, automotive, robotics, embedded applications and other emerging systems. Major MCU suppliers have been improving their portfolios to address many of these key markets. Part of that improvement process has included merging and acquiring competitors in order to gain a quick foothold into these developing markets. In 2016, NXP in the Netherlands overtook Renesas Electronics in Japan as the world’s largest microcontroller supplier with MCU revenues climbing 116% following its $11.6 billion purchase of U.S.-based Freescale Semiconductor in December 2015. Prior to its acquisition, Freescale was ranked second in MCUs and was catching up with Renesas in microcontroller sales with only $210 million separating the two companies in 2015 versus about a $1 billion gap in 2014. Renesas suffered a 19% drop in MCU dollar sales in 2015 (largely due to the weak yen exchange rate in that year but also because of the continued fallout from Japan’s troubled economy). In 2016, Renesas’ fall in MCU sales eased, dropping 4% to nearly $2.5 billion, or about 16% of the total microcontroller market. In 2011, Renesas’ MCU marketshare was 33% of worldwide microcontroller sales. The Freescale acquisition moved NXP from sixth in the 2015 MCU ranking to the top spot in 2016 with a marketshare of 19% ($2.9 billion). About three-quarters of NXP’s 2015 microcontroller sales were 8-bit and 16-bit MCUs used in smartcards. After Freescale’s business was merged into NXP, smartcard MCUs accounted for a little over one-quarter of the company’s total microcontroller sales in 2016. MCUs developed and introduced by Freescale are aimed at a wide range of embedded control applications, including significant amounts in automotive systems. NXP and Freescale both have developed extensive 32-bit MCUs with Cortex-M CPU design cores licensed from ARM in the U.K. Meanwhile, Cypress in Silicon Valley moved into eighth place in the MCU ranking with sales increasing 15% in 2016 to about $622 million. Cypress boosted its presence in MCUs when it acquired Spansion for about $5.0 billion in stock in March 2015. Originally spun out of Advanced Micro Devices as a NOR flash memory supplier, Spansion had purchased Fujitsu Semiconductor’s Microcontroller and Analog Business in 2013 for $110 million as part of its efforts to expand beyond nonvolatile storage ICs. Spansion also licensed ARM’s 32-bit CPU cores for microcontrollers in 2013. Cypress’ increase in microcontroller sales was partly a result of having a full year of revenue from Spansion’s MCU business but also growth in the company’s programmable system-on-chip (PSoC) products, which combine microcontroller functionality with user-configurable peripherals of mixed-signal and digital functions that are targeted at end-use applications. The biggest decline in the MCU leader list was posted by Samsung, which saw its sales drop 14% in 2016, primarily because of weakness in the smartcard microcontroller market. Samsung sells MCUs to OEMs but also serves in-house needs for its own brands of consumer electronics, computers, and communications systems (i.e., smartphones).